Q&A: Modern "Ming" copy sold as "Song?" Modern "Ming" copy sold as "Song?" This is a CHINESE vase. It could be from the SONG DYNASTY? This appears to be of high quality Glazed Porcelain, middle of bottom has glaze also. There are "FISH, FLOWERS & SYMBOLS", that make up this vase. This measures 6" tall. 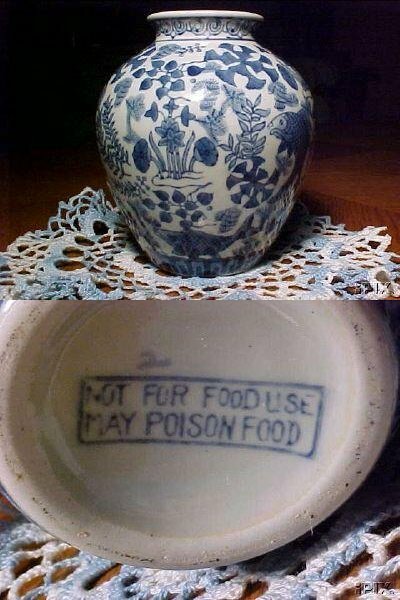 The bottom reads" NOT FOR FOOD USE- MAY POISON FOOD". This VASE is in EXELLENT condition!!! I really don't know how to comment on this. I've never seen anything on this auction site anywhere near as ridiculous. Maybe it is an example of the absurd proportions the fake selling at Internet auctions have taken, but could anyone in their right mind believe this text on the base could be found on an antique piece? This jar was offered with an opening bid of US $74,99. My personal reaction is - a smile, but I know of a lot of people who don't smile at this.